Reticle 8 (Duplex) and high (H) mounts for 11mm prism rail. 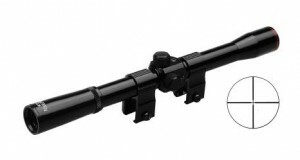 Qualities of Norconia Riflescopes: Light metal body (tube) without mount-rail, shot proof optics with special coating, centered Duplex reticles with windage-and-elevation setting, protected by screw-on caps. Focussing: Hold main-tube and adjustment ring with your left hand and turn eye-piece with your right hand to the left (anti clockwise). When focus is correct, tighten adjustment ring. Magnification change on the variable riflescopes gradually by turning the ring on the eye piece.